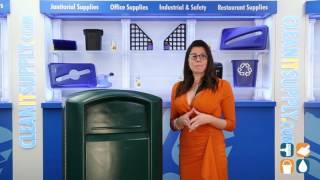 If it's versatility, durability and performance that you are searching for, the Rubbermaid Plaza 50 Gallon Garbage Can is the receptacle for you. It features contemporary styling and is constructed with durable plastics. Tie-down feature in base for secure installation. 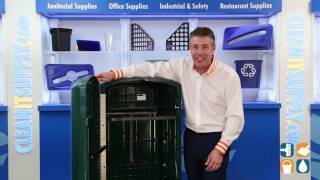 Full-height service door for easy garbage removal. Standard slide-out bag holder. 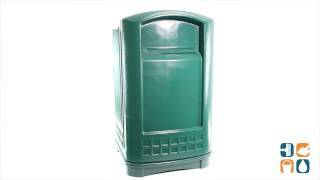 Uses Rigid Trash Liner RCP 3958 (sold separately). Lock Kit (RCP 3964-L3) is available as special order only. Dimensions are: 42.1"H x 25.2"W x 24.8"L, 50 gallon capacity. Shipping weight 78 lbs.